Video footage taken in Kisarazu, Chiba Prefecture, shows a robotic “super monster wolf” that members of the local agricultural cooperative have set up in a paddy to scare wild boars away from their crops. Measuring about 65 centimeters long and 50 centimeters tall, the wolf emits a 90-decibel growl and flashes red eyes when infrared sensors detect boars nearby. The robot is being field tested until September. The video footage was taken by Kyota Tsutsumi of The Asahi Shimbun.The solar powered lupine menace has proven so successful at scaring away wild boar from Japanese farms that it’s going into mass production. 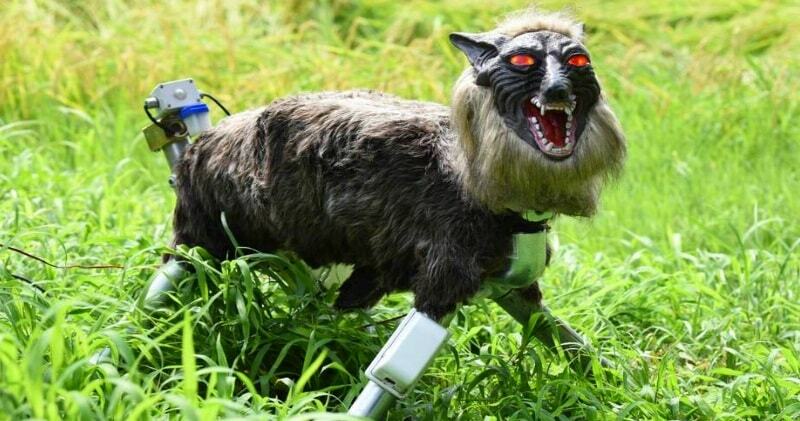 The Monster Robot Wolf is equipped with infrared sensors that sense the proximity of animals. As the animal moves into the paddy field, the robot activates, the eye turns red, the head turns, reveals itself as a living creature, and sends out 40 different deafening roars.